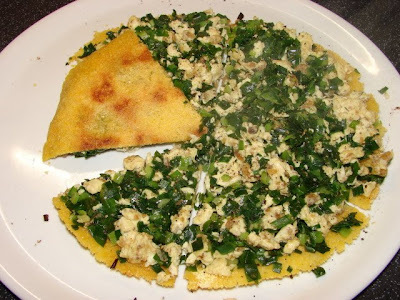 Some people called this Beijing pizza, it's an old Beijing style snack 'xiao chi 小吃', made with a thin crunchy cornmeal crust topped with Chinese chives (garlic chives), egg and a little dried shrimp for a more savoury flavour. Very tasty. Pictures are a bit fuzzy due to the hot steam. 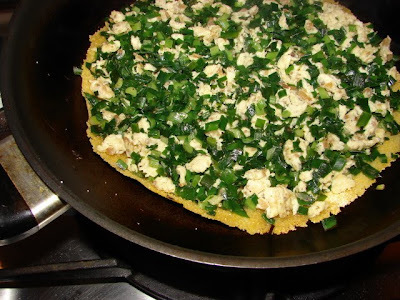 * you can also use cold water, I find hot water makes the cornmeal absorbed more water making the crust less gritty. Mix the cornmeal and pinch of salt together then mix with water. Leave to rest for 10 - 15 minutes so the cornmeal can absorb the water. 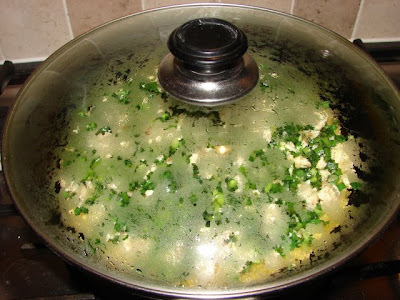 Add about 2 - 3 tbsp of cooking oil to wok or frying pan, fry the dried shrimp at medium high heat for about 1 - 2 minutes till it is no longer too fishy smelling and getting a bit brown. 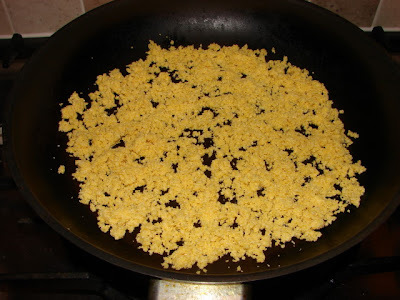 Turn the heat to high, and drizzle in beaten egg while stirring to form fine bits of scrambled egg. When the egg is set heat off. 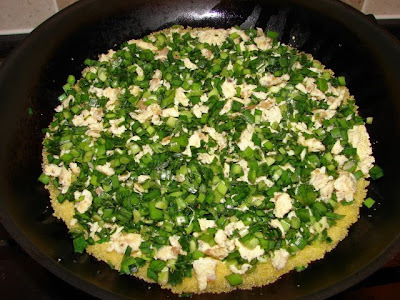 Mix egg and shrimp mixture with chives, seasoned with a little salt and pepper. 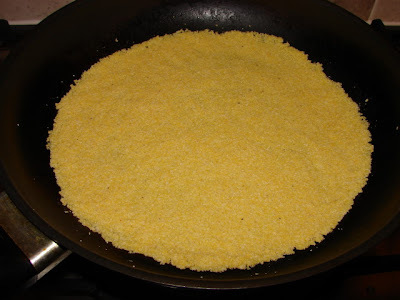 Using a cold dry frying pan (I used a 30cm non stick frying pan), sprinkle the wet cornmeal onto the pan and spread it out/press with a soft spatula or fingers to form an even thin crust. Then spread the green mixture on top. And drizzle a little cooking oil around the rim of the crust. Lid on and let this cook at medium heat for about 6 - 8 minutes or till you feel the lid is really hot (need the steam to cook the chives) and the bottom crust is golden brown or you may see the crust lifting up around the rim. Then it is ready to transfer onto a plate. The crust is quite solid so it is quite easy to move it. 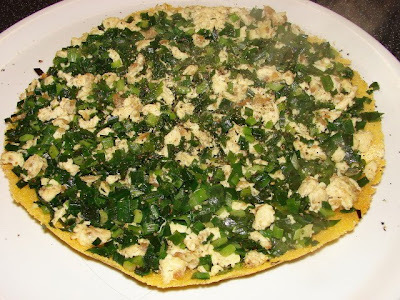 Sprinkle with a little sesame oil and more ground pepper if you like. Cut into wedges and serve straight away. Simple and intriguing recipe. Thank you for sharing. this looks really, really good. regarding the dried shrimp, may i ask you a q (since you are my touchstone for food from that part of the world.) i went to a v traditional dim sum place where i ordered noodles in a shrimp sauce. when it came, there were no shrimps, so i asked the hostess, who said, oh shrimp sauce does not mean whole shrimps, there are dried shrimps in it. it was really, really good, but i learnt smthg new. is this a cantonese thing, perhaps? Not sure what this noodles in shrimp sauce is in Chinese or I will be able to tell you what should be in it. Not sure any Chinese recipe would list shrimp sauce with just dried shrimp. I love this dish. Our Chinese ayi used to bring it to me, made fresh by her husband. I never knew how to make it, and since she wasn't the one cooking it, she wasn't sure how to tell me. I can't wait to try it!